When you spend any amount of time in the outdoors you must know by now that there are some must-have items that you need to bring with you each and every time. Very little is more dangerous than having no equipment and things are taking a turn for the worst. You might have come across the 10 C’s at some point in your survival career. The 10 C’s is a list of survival gear essentials that have been put together by expert survivalist David Canterbury. The 10 C’s are all items that you need in your basic outdoor endeavors and should things take a turn for the worst, these items are an absolute must to survive for more than 72-hours. These items are what you would need in an emergency kit to survive a 72-hour scenario where you would be waiting for search and rescue or looking for help. And there’s plenty of circumstances where people have just walked off the path, only to end up missing for several days, so there’s no doubt survival gear has its benefits when you are regularly enjoying the great outdoors. The first five in this list, according to David Canterbury, are the items you should never step outside the front door without. The next five items in the list, (6-10) are items that will help you in any survival situation. Let’s take a look at each one and what they involve. A quality cutting tool is a survival gear necessity out in the wild. Not only can it be used to cut trees and branches, but it can also be used to create almost anything in the wild. Quality knives also allow you to recreate a lot of things that you might not have but need in order to survive. This is especially the case if you have had the knife attached to your belt but have lost everything else that you were carrying with you. Make sure your cutting tool is a quality knife so that you can use it for the harder and more forceful tasks as well as the smaller crafting tasks. Cheaper knives may break at the join when you are using excess force on them, or their alloy steel may bend under pressure. A good survival knife doesn’t have to be expensive, and some of the most-relied upon brands can be easily purchased for less than $100. A good survival option is the KA-BAR, which is also a knife used by military as standard issue survival gear. Gerber has a Bear Grylls collaboration survival knife designed to be used in various bushcrafting and survivalist scenarios. Ferro fire starters were first developed in the military as a way to start fires at high altitudes and low temperatures. Much like a lighter, they create a spark which can light gas, flammable liquid, or the tinder in a small stick fire. They are said to be the most reliable fire making instrument because of their use in any given situation. Having a fire making source is incredibly useful and necessary in outdoors situations as it allows you to stay warm, to work with heating materials such as charcoal, clay and log cutting, and as a source of light and heat for water boiling and food cooking. An essential part of survival is to ensure you are protected against the extremes of weather, whether that be the hot sun or the freezing cold. When you are out in the wilderness, it goes without mentioning that you should keep your core temperature protected as much as possible through insulation and cover. Carrying something as simple as a wool blanket can provide you warmth, a comfortable sleeping environment, a shelter, shade and can be a protective insulator. Wool is also highly recommended as the choice of material because it can retain almost all of its insulative value even if it is completely wet. There are other great survival gear innovations that perform just as well as the wool blanket and are lighter and more compact such as the Life Bivy emergency sleeping bag which is waterproof and an extremely good insulator for body heat. It is also very similar pricing to any wool blanket. Primarily useful for collecting water, a container should always be kept in any kit. Hydration is the most important survival necessity as we can only last less than three days without it before we suffer fatal effects. The purpose of a container is two-fold. First, it is a drinking and holding utensil so it can hold any water you might have found at a resource such as a creek or a stream. The second part of that is you can use a metal-based container to boil and sterilize water. Cordage can be used to construct shelters for cover and warmth, tools and implements, or any hunting and food devices. Having just a small amount of paracord in your bag or kit will take up no space or weight whatsoever but will always find a use in the things you need to do to survive. Making your own cordage is possible in the wilderness with vines, or green bark, but that’s only for a small length, with cordage you can easily pack 10m of paracord in a pack and cut it up to the lengths you need. Or you can cut it down to size for any smaller things such as first aid splints, holding up pants, or tying up a torch for while you work at night. 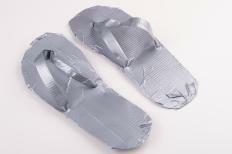 You can use duct tape for anything, even shoes! Cargo tape is another word for duct tape, which has a strong place in every survival gear kit. The number of uses I have personally seen with duct tape are inventive, to say the least. You can use it to patch clothing, tents, fix a hole in a bag, as a strong band-aid and even use it as a way to butterfly stitch an open wound together. Some people do prefer to carry a large roll of duct tape just in case they need to use excess amounts. However, I keep a small folded up length of duct tape which fits into an everyday carry satchel and takes up less space for the purpose of being a small satchel. Duct tape is tough and durable as well, which is why it is such a popular material. It is so tough that it has been popular to make DIY duct tape wallets and duct tape shoes. Keeping a cotton square piece the size of a pillowcase can open your abilities to a number of survival skills. A pillow-cased size cotton sheet can give you a good amount of bandages for first-aid to use to apply pressure to a bleed, or to dress a wound as well as being able to use it as a washcloth for wounds. You can also use something like a cotton bandana to carry things such as food or supplies, tinder for a fire and char cloth. A quality compass with a sighting mirror and moveable direction ring will allow you to navigate more effectively through the wilderness with a definite direction, rather than walking around in circles. The mirror on functional survival compasses can also allow it to be used for signaling sunlight, or for viewing body positions where you may have an injury that needs tending to. As far as compass brands go, the brands I have used are both Suunto and Silva who both make great functioning compass products with the desired direction ring and mirror. A fully-charged headlamp means that you can effectively move around and do things in the dark at night without having to take up one of your hands by carrying a flashlight. Basically, everything done at night needs light, especially if you are in the wild. Whether it is trying to find something, constructing a fire. or simply navigating your way at night having that light. and the ability to use your hands without a torch, that much easier. It also prevents you from tripping over a log or branch as you move around. which can hinder your chance of survival greatly. Headlamps are also another ridiculously cheap piece of essential survival gear. When they first came out headlamps were a highly overpriced market. but now due to innovations and mass manufacturing, you can easily pick up a headlamp under $30 without sacrificing quality or function. Some great notable brands that are popular with hikers and night runners are Shining Buddy, SmarterLife, and PathBrite. A canvas needle can be used for any type of repairs that might need to be done to a tent, shelter, pack or clothing. I would generally keep something like this in the first aid kit, but if you are looking at the bare essentials of survival gear, this would be the go-to item for picking out splinters (happens a lot with the dry wood in my area). For Canterbury, he has his securely sitting in his knife sheath so as to be able to quickly access it, should he need it.